UIT third generation of unified storage SV5000G3 products to Intel 64-bit high-performance multi-core memory dedicated processor as a driving force through multi-protocol support for 16Gb FC SAN, 10Gb IP SAN and 12Gb SAS perfect integration, the effective integration of existing user storage network architecture, Unified deployment and centralized management of high-performance SAN networks. UIT third-generation unified storage SV5000G3 products are fully applicable to medium-sized databases, cloud computing, cloud storage, virtual data centers and other medium-sized data processing applications, and widely used in finance, telecommunications, government, manufacturing, energy, medical, transportation Logistics, wholesale and retail, education and other industries. UIT third generation of unified storage SV5000G3 products to Intel 64-bit high-performance multi-core memory dedicated processor as a driving force through multi-protocol support for 16Gb FC SAN, 10Gb IP SAN and 12Gb SAS perfect integration, the effective integration of existing user storage network architecture, Unified deployment and centralized management of high-performance SAN networks. Data integrity with automatic tiering, SSD L2 cache, cache partitioning, data flow control, and a variety of green energy-efficient designs combined with advanced data protection to maximize business continuity, maximize performance and minimize operational and management costs. Improve return on investment. 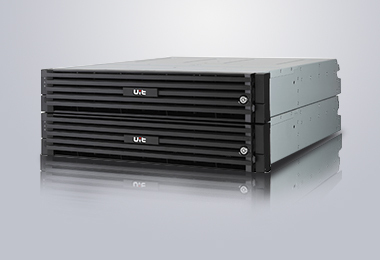 UIT third-generation unified storage SV5000G3 provides a variety of host interfaces: 8Gb FC, 16Gb FC, 10Gb iSCSI. Back-end with SAS 12Gb hard drive expansion interface, which also provides 3.5 "hard drive and 2.5" hard drive. The UIT SV5000G3 supports both SAS drives, NL-SAS drives and SSD drives to meet the needs of a flexible tiered storage architecture. UIT SV5000G3 products adopt the industry leading 64-bit multi-core processor, PCI-e 3.0 system bus, 12Gb SAS, 8Gb, 16Gb Fiber Channel technology, 10Gb Ethernet and other high-speed transmission technology with 64-bit operating system, enhance system processing capacity, Hundreds of thousands of IOPS, several GB disk read and write bandwidth, can fully meet the needs of a variety of medium-sized database of high IO applications and a variety of high-throughput applications. UIT SV5000G3 through the SSD as a secondary cache to use, greatly improving the storage cache hit rate, to avoid the frequent low-speed hard disk read and write, greatly enhance the overall performance of the system. SSD can also be used as a controller memory mirroring, to enhance system reliability. The UIT SV5000G3 supports intelligent management of stored tiers of stored data. When the hot data is accessed at high frequencies, the UIT SV5000G3 automatically saves it to a high-speed SSD or SAS disk; when the frequency drops into cold data, it re-distributes the data to the high capacity and efficient NL-SAS Disk. All operations are automatically completed in the idle time, without affecting the performance of the host under the premise of greatly enhance the storage efficiency, reduce the use of cost. 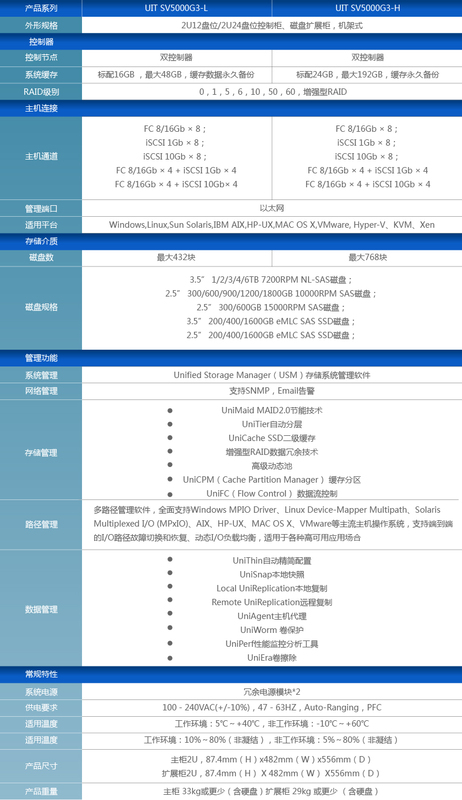 UIT SV5000G3 can be used for different LUN cache partition, more efficient use of cache, improve the performance of applications to read and write disk. UIT SV5000G3 I / O control of different LUNs to achieve performance balance; or to meet the performance requirements of I / O high service and business guarantee I / O to meet the requirements. Thin provisioning can dynamically and dynamically change the partitioning of storage capacity resources based on the current capacity requirements of the application or user, thus making full use of the effective storage space of the disk array, reducing the capacity requirement of the user to purchase the storage array, The cost of purchasing storage space. In the dynamic allocation, based on the UIT SV5000G3 can further perceive the use of space on the application, the release of the space for recycling. Green storage devices, green building is an important part of the engine room. UIT SV5000G3 products support multi-level MAID technology, so that the hard disk in the data access to start, no need to always be active, in order to achieve energy saving effect, the average user can save 30%. UIT SV5000G3 built-in MAID2.0 technology can reduce the frequency of access to effectively extend the life of the hard disk, mainly for backup, archiving and other near-line storage applications. 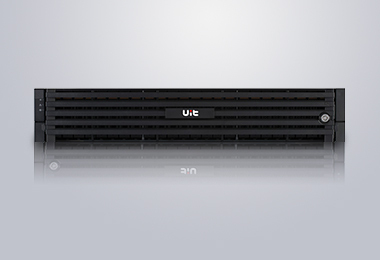 Through creative exhaust ventilation design, UIT SV5000G3 can support high temperature at 40 degrees Celsius long-term stable operation, reducing the cooling environment of the engine room requirements, thereby reducing the overall energy consumption of the data center. UIT SV5000G3 uses the industry's highest specification 80plus platinum certified power supply, by improving the efficiency of the system to reduce power consumption. 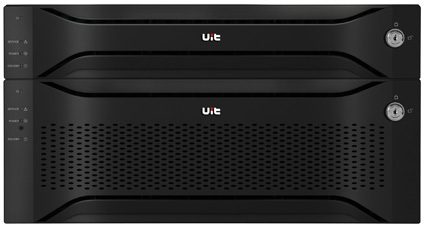 UIT SV5000G3 products using modular full redundancy of the hardware design, with failover, link redundancy and non-disruptive firmware upgrade technology to ensure maximum business continuity; innovative data cache backup technology, the system will be cached after power-down Data is written into the permanent flash to ensure that the data will never be lost; accurate fault detection, isolation, error correction, bringing higher system availability. The UIT SV5000G3 adds periodic inspection and cyclic verification of static data, greatly protecting the availability of archived data. UIT SV5000G3 through the original enhanced RAID technology, can simultaneously support the retention of two copies of the core data in the case of 2/3 hard disk failure is still not lost data to meet the enterprise applications for higher demand for higher availability.